Half Way There, Oh No! What you see in the picture is setting me into panic mode. It is November 8, and I am half way to complete the first draft of The Book of Sharon (book 2 – The Dinorah Chronicles). I set a goal to finish the first draft of the novel by December 31st, and I have less than two months to do this. I have to say that I expect to finish it in time, and I will be very disappointed if I don’t (but I will). This novel presents its own challenges because of the format in which it is written (I won’t say more) – not typical. Despite the novel’s challenging approach, and a few challenges of my own, I am excited to push to meet the deadline, and will celebrate when I do. 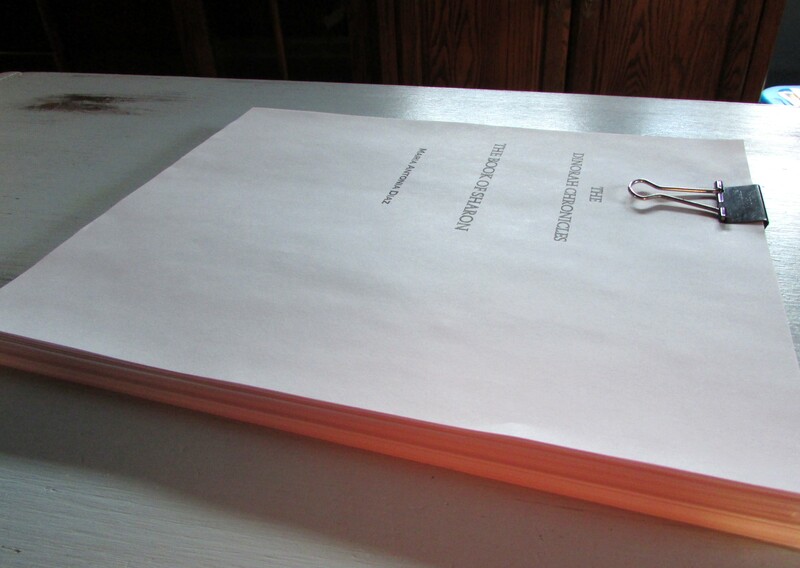 After the first draft, I usually go through 2-3 more drafts, and a final edit before publishing. It could take months before it is ready to fly. The good news is that the cover is ready (so far, unless I happen to change my mind). So it is just down to finishing the story. Part of the issue of finishing it on time is that I had prepared a rough short outline, a very basic bulleted list of what I thought the story would look like when finished, and that changed as we speak. The story took an unexpected turn, and I am not forcing my outline on it. I want to know where it will take me. Maybe it will take a different direction, or it may be just a turn that will eventually meet my intent, who knows. I know as much as you do now, but I am very excited to see it develop some more. For now, although a bit worried, I am happy that I am half way there. I find deadlines useful, but I often ignore them. My second published novel took me 22 years to finish the rough draft. I am working on a book now that the concept was created in 1977. My current deadline is May 30th, 2014. 37 years! Best wishes and congratulations. I find that I work better with self-imposed deadlines. It keeps me focused and I love the challenge. It is almost second nature by now.